In ca. 1848 Montpelier’s roof was replaced with a standing seam metal roof. With the Madison-period roof long gone, how could the Restoration Team determine what the ca. 1797 roof looked like? During the 2001 investigation, a shingle with a nail was found that dated to the Madison occupation of Montpelier. This shingle, as well as ca. 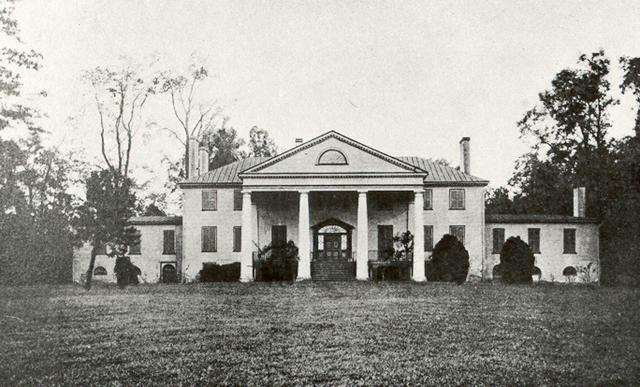 1830 illustrations of Montpelier, provided enough evidence to prove that the main block of Montpelier featured a wooden shingle roof during the Madison-era. A wooden shingle roof was not a surprising choice and wood shingles were by far the most popular choice in roofing in the 18th and early-19th centuries (Mount Vernon, Stratford Hall, and Gunston Hall all had wood shingle roofs). While metal shingle roofs started to be installed in the 1820s, it was not until the 1840s and 1850s that standing seam metal roofs began to replace wooden shingles as the most popular roofing type for gentry-level houses. Montpelier's ca. 1848 standing seam metal roof from a photo taken in ca. 1890.